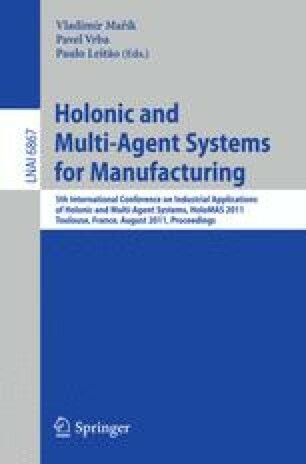 This paper presents a flexible and reconfigurable assembly cell designed using the Holonic Manufacturing System paradigm. The function of the cell is to assemble damped machining tools. The automation is challenging due to the size and frequency of changes in the product spectrum. The current version of the cell is composed of an assembly robot, a pallet transport system, the feeding equipment including a custom elevator, and sensors including stereo vision systems. The Holonic Manufacturing System paradigm has been used both for the architecture of the real-time control system and for the mechanical design of the cell. Therefore, when appropriate, the holons do not communicate through software or signal but through the realization of their tasks and the use of sensors to update the view of their environment. The system demonstrates the advantages of the Holonic Manufacturing System paradigm to achieve the required reliability, flexibility and reconfigurability of smaller manufacturing cells.